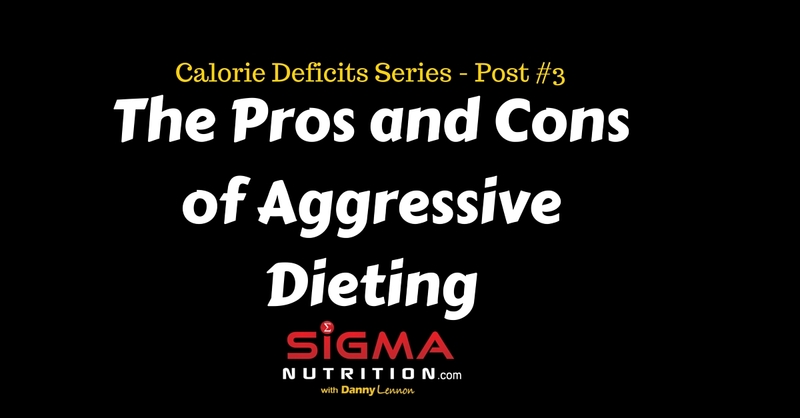 In part two of this series we discussed how fast rates of weight loss through large caloric diets CAN be used without loss much (if any) muscle mass. Especially in those with a decent amount of fat to lose. So should YOU use an aggressive diet? By the end of the 6 month period they had experienced more weight loss than the other groups who had dieted on a milder deficit. 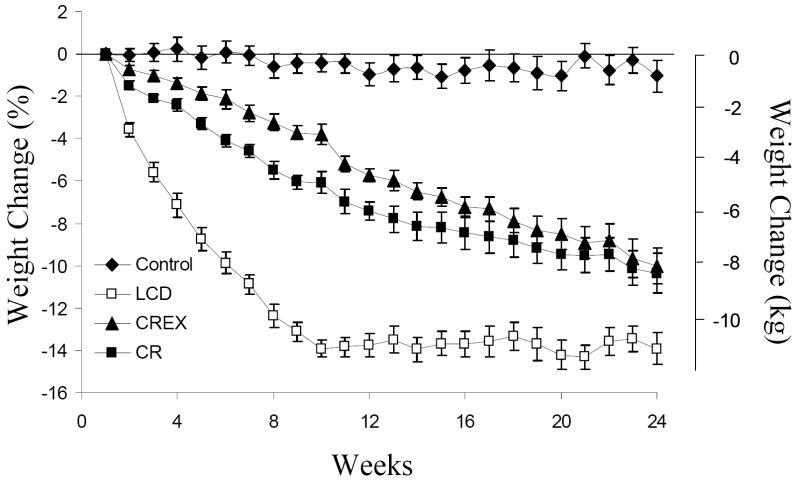 However, what is more interesting to me, is that they achieved this greater weight loss at the 6 month time-point despite actually only dieting on average of 8-11 weeks out of the 24 weeks of the study. And to me, therein lies the potential benefit (for some people) of a more aggressive diet; you can get the fat loss phase done in a much shorter period of time. Do they find the idea of slightly under-eating for a long stretch of time something easier to do than drastic restriction? Then a milder deficit with an extended dieting period is probably best. Do they find the idea of slightly under-eating for a long stretch of time to be akin to a living hell and find doing shorter concentrated bursts of very restrictive dieting to actually be more psychologically appealing overall? Then an aggressive diet for a shorter window of time is best. So really it comes down to selecting as much of a calorie deficit that is manageable for the individual in question. That includes being both psychologically “manageable” as well as physically manageable; how much of a deficit can they be put in without completely destroying training performance, recovery, mood, energy and ability to avoid breaking down and binge-ing. On the physiological side, data from Trembley et al. 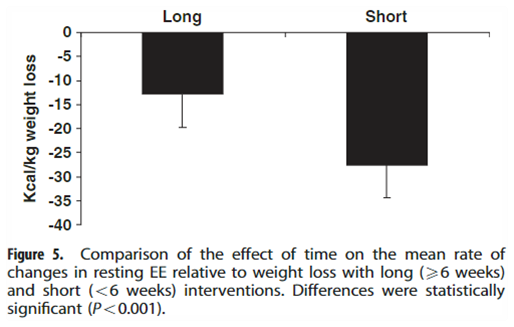 (2013) suggests that shorter (< 6 weeks) more aggressive dieting bursts lead to a greater decrease in resting energy expenditure that those in which the diet was carried out over a longer period of time. So there is a sharper adaptation of the metabolism. However, we must remember that the dieting duration should be decreased and so the diet can return to maintenance intake or above soon, which will reverse most of the metabolic adaptations that have occurred. On the more practical side, the obvious downside to aggressive dieting is that you have to eat less food, do more activity or a combination of both. Less food isn’t fun. And therefore it’s more difficult in an acute sense. Less food also means that you need to include more dietary restraint. So you by nature will have less flexibility with your food choices. You just can include the same foods (and/or portions) that you could if you used a more gentle caloric deficit. Less food will decrease your maximum recoverable volume (MRV). You just can’t recover from training to the same extent as when you are on a higher caloric intake. Who is an Aggressive Diet Potentially Best For? Slow, sustainable weight loss isn’t always best. Rapid, aggressive weight loss isn’t always best. Context matters, imagine that?! Need to calculate macronutrient targets based on your personal variables? Download the Sigma Nutrition Macronutrient Calculator for free. Get targets for male & female, muscle gain, fat loss and maintenance.